The Club is incorporated as a non-profit organization with a Board voted in annually in accordance with our Members Handbook and Constitution. Membership: Membership is only required if you wish to enter the Club Competitions, contribute to the forum or be entitled to reduced fees for certain paid workshops. For more details on Membership and to join the club for the current year, please see the Membership page. 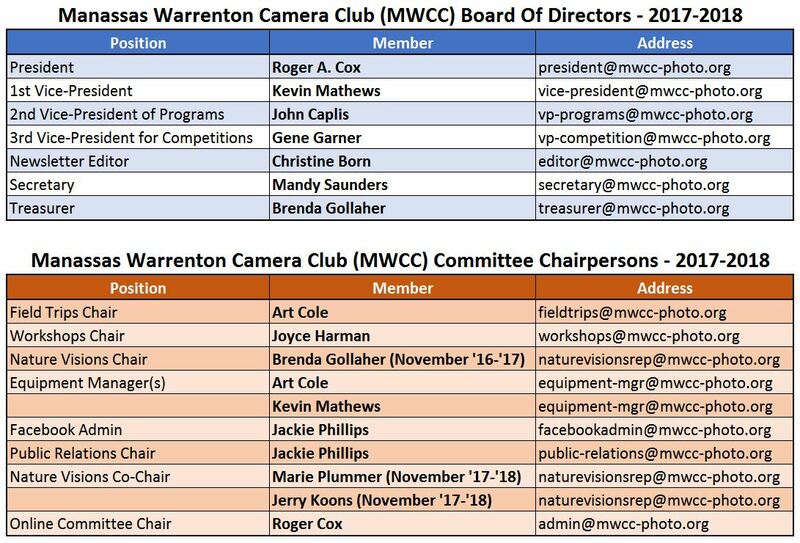 The current Board and Committee Chairs are detailed in the attached table. You can click on it to see an enlarged view. Please feel free to contact the Secretary or any of the officials of the Club for further information about the Club or our meetings and events. Affiliation Links: MWCC has affiliated with B&H Photo in New York, one of the oldest and most reliable vendors of photographic and audio/video equipment and supplies, and with Amazon – which can be used for any Amazon product. Each time you place your orders through the following links, the club will receive a small remuneration to be used to further the club’s activities. Try it below or see the search links in the right hand border.